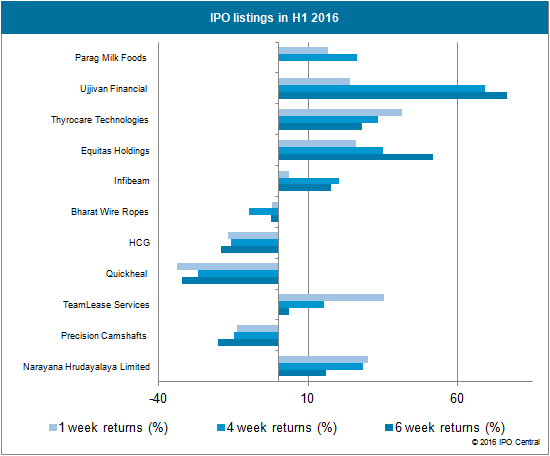 The Indian IPO market continued to see heightened activity in the first six months of 2016 with as many as 11 IPOs getting listed on mainboard exchanges. In addition, IPO of Quess Corp opened on 29 June. In total, the 11 IPOs mobilized INR73.56 billion (INR7,356 crore). As always it was a mixed bag for the IPO market as there were a few misses as well in an otherwise positive market. Among the losers were Precision Camshafts, Quickheal, Healthcare Global, and Bharat Wire Ropes. On the other hand, Narayana Hrudayalaya, TeamLease Services, Infibeam, Equitas Holdings, Thyrocare Technologies, Ujjivan Financial, and Parag Milk Foods rewarded investors with positive returns. 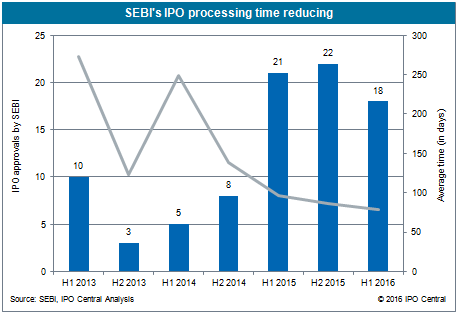 Meanwhile SEBI continued to do a nifty job of compressing its processing time of IPO applications. The capital market regulator took an average of 78.9 days for clearing 18 IPO applications. This figure, including public holidays and weekends, is the best score by SEBI in at least three and half years. Coming back to the main theme, the market saw 11 listings in the last six months, continuing the momentum created last year by 20 listings. However, it was not a smooth sailing as investors lost money in four IPOs. Investors sustained maximum damage in Quickheal as the stock of the IT security company continued to remain below its IPO price of INR321 per share. 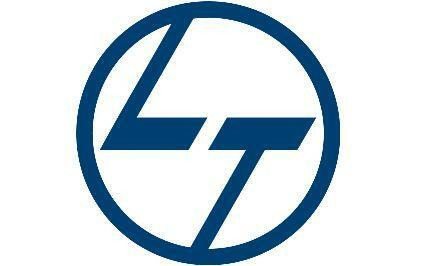 Similar was the fate of auto component manufacturer Precision Camshafts which kept sliding after the listing. At the end of six weeks, investors holding the stock had lost 20% of their investment. For the regular readers of IPO Central, there were enough red flags in the IPO including the exorbitantly high executive compensation that warranted a clear avoid on the offer. Unfortunately, retail investors did not take cues from high net-worth individual (HNI aka NII) category and bid 1.91X in the category. Bharat Wire Ropes – smallest of the lot with IPO size of just INR70 crores – also disappointed investors. Losses were limited to single digit in our key readings after one, four and six weeks of listing. The manufacturer of wire ropes did not have management issues but big and institutional investors stayed away due to low profit margins, limited growth prospects, and growing competition from cheap imports as highlighted in our review of the IPO. While investors lost money in these cases, the remaining seven offers rewarded IPO investors with positive returns. Most prominent of the lot was Ujjivan which rewarded investors with nearly 24% return within seven days of listing. The returns continued to grow with each passing week and stood at nearly 69% after the end of six weeks despite the selling pressure. Same progression of profits was seen in microfinance peer Equitas Holdings which went from strength to strength during this timeframe. By the end of sixth week, the stock had delivered more than 51% returns. This is not surprising as we noted for both IPOs that their fundamentals were good and the companies stood to gain from their transformation into small finance banks (SFBs). We also noted that regulatory requirements were pushing the IPOs and thus, the companies left money on the table. Price movement of both companies indicates once again that investors in the IPO market are better off by not selling on listing and holding for fundamentally strong companies. By this time, the selling pressure subsides from key shareholders such as anchor investors. Another notable performer was Thyrocare Technologies which traded 41% above the IPO price by the end of the first week after listing. While HCG’s hub and spoke model was debunked by investors, the Navi Mumbai based diagnostics firm got thumbs up from investors for the same business model. As we noted in our analysis of the IPO, management integrity plays a big role in success or failure of companies and A Velumani scored full marks on this front. The exuberance in the IPO market continued outside of these star performances as well. Even Parag Milk Foods, which we criticized for steep pricing, went on to reward investors after cutting price and extending the IPO by another three days. The company has a solid business and a strong brand in retail market and the only glitch was high valuation. With the reduction in IPO price, listing performance was natural as grey market and kostak rates indicated. Going forward, the IPO market has already seen massive oversubscription for Mahanagar Gas IPO and we are sure the winning streak will continue with Quess Corp IPO as well. As always, we will keep a vigilant eye on the upcoming IPOs. Infibeam IPO review: Bagholders, any?